I travel a lot and I have very good orientation in my nature. Besides that, I often took a map and check different approaches to some destination, watch roads and relief on map, check where I can drive… So living with retro maps isn’t hard for me. In some situations I really love it. But I also love road navigations. They can be really helpful in many situations. Sometimes I don’t want to stop and ask for a right direction. Sometimes I change my mind and looking for location that wasn’t planed before. Sometimes it can be helpful if your car run out of fuel… There are many situations when road navigations will be a good friend. Personally I don’t have a dedicated GPS navigation device. I use my Android phone with navigation maps. Phone isn't the best solution, because screen can be too small, you can get a phone call or some other termination between navigation… But I can live with this. It is still better for me than having another device with its own cables and accessories. My characteristic is using navigation without guided voices. I don’t want to listen electronic women talking all over and over. Generally I know where to go and I don’t need those annoying voices. If I’m in trouble, I throw my eyes on screen and it is enough to check next (two) actions. I tested almost all what can be found for Android, but here are my favorite four applications. Some of applications isn’t bad, but have maybe limitation that isn’t suitable for me. So try it for yourself if you think, that one of listed below isn’t good for you. On the other hand, testing is very time consuming and you can believe to my choice because it was tested over months (or years) in different situations. What follows isn’t classic review of road GPS navigation systems. You can find many of that type of reviews on the web. This is just my point of view for some of best road navigation applications. Review will be short and you will find just observations from really driving. You won’t find and features listings and descriptions. So, let’s go in alphabetical order. + Very good maps – as expected from Google. + Google Maps can show satellite view (good for orientation sometimes). + POIs are labeled on maps with names (e.g., Hotel Sonnenblick, Airport Bovec…). 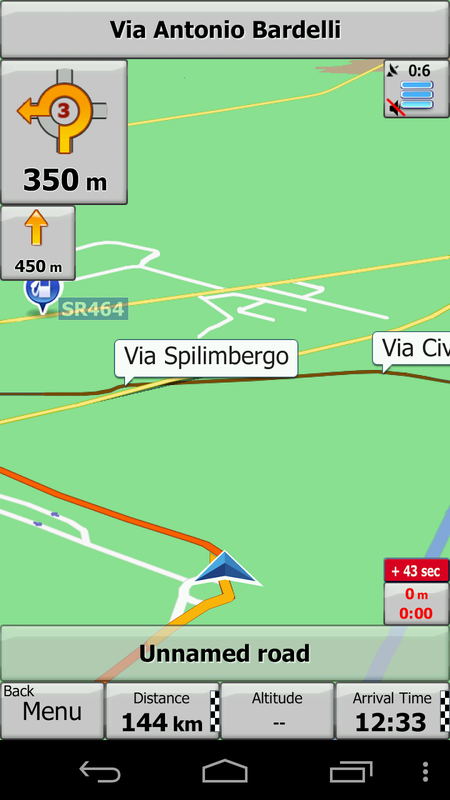 + Route alternatives are shown on the map while driving with time difference. - Only important roads have different colors. All others looks the same and this isn’t good. - Navigation shows too many not necessary actions. For example: if you don’t need to turn, there is no need to repeat that you have to drive straight on. To make things even worse, there is a name of place written near arrows. And this place is sometimes with the same name as location out of our way (when settlement is a little away from road). - If you want to avoid highways (or toll roads), it is important that you use Route options at the beginning. You can’t change that while on the road. - Google Maps is online navigation. You can download some parts of map and use it. But if navigation will need recalculation, it won’t be able to do it without internet connection. In my latest test, Google Maps eaten 24 MB of data for two hours of navigation. - No speedcams and speed limits. - When I come to highway junction, navigation didn’t navigate me even if I have two different ways to go. It is very embarrassed, because driver can miss direction on highway! + Very good navigation in practice. + Maps from different providers for many countries. + Two next actions on the screen. - You can buy Android version only in some countries. This pushes users to illegal market. For example – it is available in Turkey for 15 EUR, and in Israel for 48 EUR. - Clumsy work with maps when you are just watching a map. - Slow behavior in settings. - Speedcams warning has very annoying behavior (beeping many times) and users have a lot to do, to make it acceptable. + Very good business model (full free trial, limited free, addons, download only desired countries, many discounts…). For example - at the moment, the price is 25 EUR for all European countries. + Nice user interface (especially Settings part). - Slow reactions when car changes direction. If there is many actions nearby, this can lead to confusion. - Line assist is shown very late. - Uncomfortable arrow display – it shows that you drive 5 km without any additional information. Then (one kilometer before action) arrow is suddenly changed and show next action. Why a hell can’t be this action on display from 5 km before? - Location on screen is always a little before real location. - Almost all road are the same colors and wide. This is annoying. - Arrow for your car position is too big. - Sygic offers Speedcam addon. This is nice, but it is available just in some countries. In other countries you have to add speedcams as a POI. This isn’t very comfortable way of working with speedcams. - If you change your mind and go on alternate route, Sygic long insist to go back to his suggestion. It takes quite a bit to understand that driver took another road. - In areas where the road is transversely on the hill, Sygic display this very ugly. - Arrival times are often inaccurate. I get an ETA (estimation time of arrival) some minutes, but I have more than 60 kilometers before me. Besides this, I also found a bug if I start early in the morning and go to other country. It shows UTC time, then in the middle of route it jumps to UTC+1 time (what was right). - Buildings are usually far away from real situation. 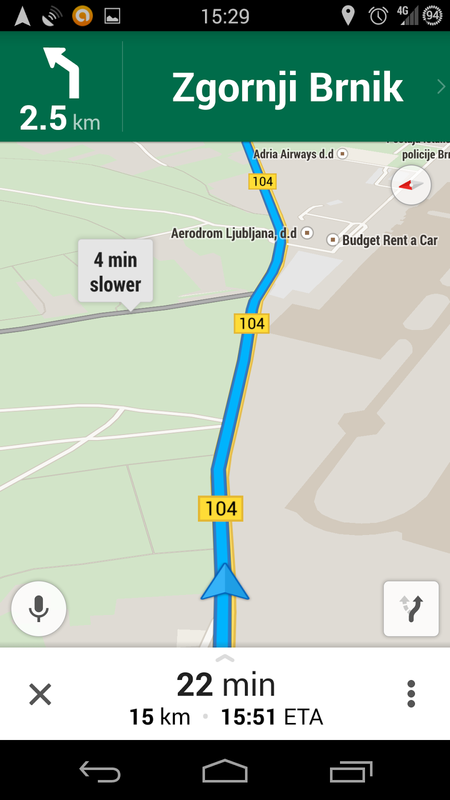 - Sygic has small arrow on the edge of the screen which shows direction where your final destination is. But, this doesn’t work for me. I don’t know how it works (maybe tries to use magnetic compass in car :-)), but it simply doesn’t work. UPDATE (30. 8. 2015): Check also my newer Sygic review. + Works quick and reliable. - Expensive - 43 EUR for Europe. Bad variation of available maps collection. I don’t need Europe, and it eats almost 5 GB on my phone. Individual countries can’t be deleted, so we can’t release some space. - Minimalistic view. This can be a plus sometimes, but it is so minimalistic, that it doesn’t show tables on highway. Just a small word or two for exit. - For my feeling view is set to high. I would like to see, if it can be set more naturally – this means that view should be more similar like drivers view. Now it looks like driver looks on a road from a plane. - Car location is late and this can lead to problems when there are many roads and turns. - It would be nice when application has more settings. - I miss line assist. Maybe it exists, but isn’t very good implemented. - Roundabout doesn’t have marked right exit. It is just displayed, but without numbers. It is helpful to know, that you have to exit on third exit. Much better than just see a pictogram of roundabout. - There is a bug if you prepare route at night and then start over the day. I have dark view (night view) some kilometers before TomTom change it. 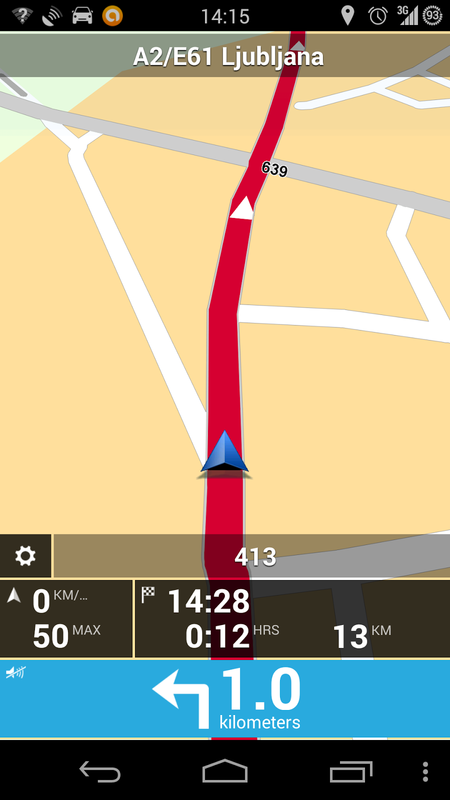 My suggestion for road navigation is IGO Primo. It offers a lot, has a very good navigation, plenty of settings, it is clear and can uses maps from different providers. TomTom follows with big setback. I would set Google Maps on third and Sygic on fourth (last) place. Sygic has a lot of fans, but this is mainly consequence of good marketing. They have a lot to do, to catch IGO Primo in terms of good guiding. I think your correct about the IGOPrimo as the maps are pretty accurate here in the UK. Though sometimes suggest a U turn if the particular road is unfamiliar. Really useful review helped to make a quick decision on which app to get. I tried Garmin,Sygic,TomTom, Igo and every app on play store. IGO beats them all. Tried them in Wince and android. None allows for the level of customizations of IGO. Really superb. I agree ... and wait IGO Nextgen. Yes, the iGo country limits are incredibly frustrating. I have an in-dash GPS unit from China that included iGo Primo on a WInCE system. It works PERFECTLY. I want something on Android that does the same thing, but I've discovered you cannot buy iGo in the USA. Why? It has maps for the US! It is really very strange. They have an Android version of IGO (Primo and NextGEN), but you can't buy it on Google Play. It is used only on Android devices with IGO and for (rare) countries (Hungary, Singapure ...). I have asked them why, but I get only a typical corporate answer ("we will let you know, if it will be available"). Interesting - IGO for Android is available on some pirate's websites. Maybe you could post an update for TomTom navigation, since TomTom GO came out in mid 2015, and replaced the app you reviewed. It is completely new user interface with vector maps. I tested it myself and it is really good. No lag and calculates roads instantly. Also, it comes with new business model. It is free for 100 kilometers per month. Also, I am surprised you haven't checked out nokia HERE. Lala123 - thank you for you comments. Please check and review "Magic Earth" Android navigation. Magic Earth looks nice, I will try it.